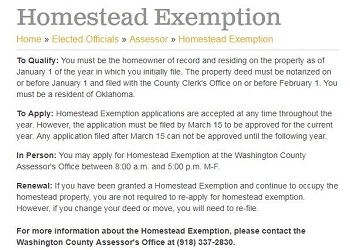 The Washington County Assessor's Office will once again conduct its annual taxpayer assistance days at a couple of locations within the county. According to Assessor Todd Mathes, the pair of events will allow taxpayers of rural Washington County the convenience of applying for all eligible property tax exemptions at a location that is closer to their home than the county courthouse. Residents within the county may also take advantage of the events to hand-deliver any of their 2019 personal property renditions to the assessor's office. Mathes says the event gives you the opportunity to file paperwork close to home. Mathes says that a deputy assessor will be on hand to answer any questions pertaining to property tax exemptions and to assist citizens in filling out either their exemption forms or any rendition paperwork. He says there is a number of exemptions that you may qualify for. Mathes adds that eligible disabled veterans just need to bring their official notification letter from the Department of Veterans Affairs and a current picture ID to either the assessor's office or the designated rural location to receive the exemption. The valuation freeze is only available for eligible homeowners 65 years of age or older. Representatives will be in Ramona City Hall on Tuesday and in Copan on Wednesday. Each event will last from 9 to 4 o'clock.